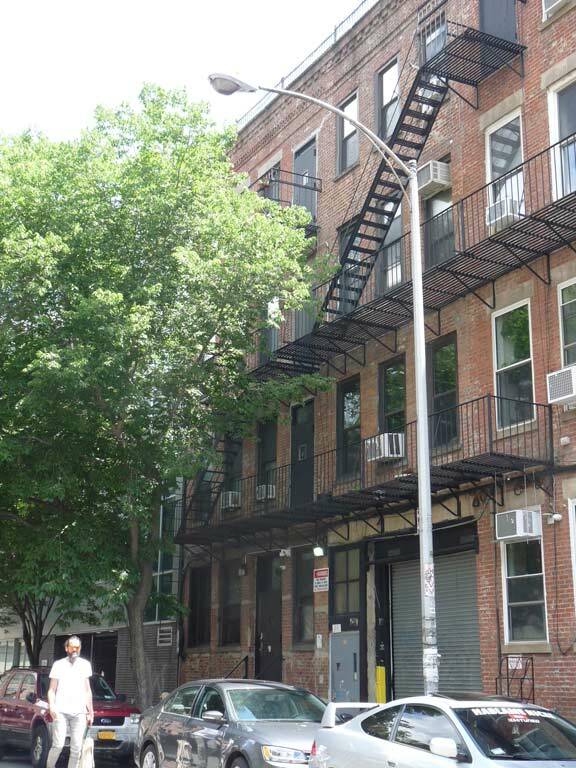 I’ve written about tiny Dunham Place (pronounced “dunnam”) before, back in 2008. 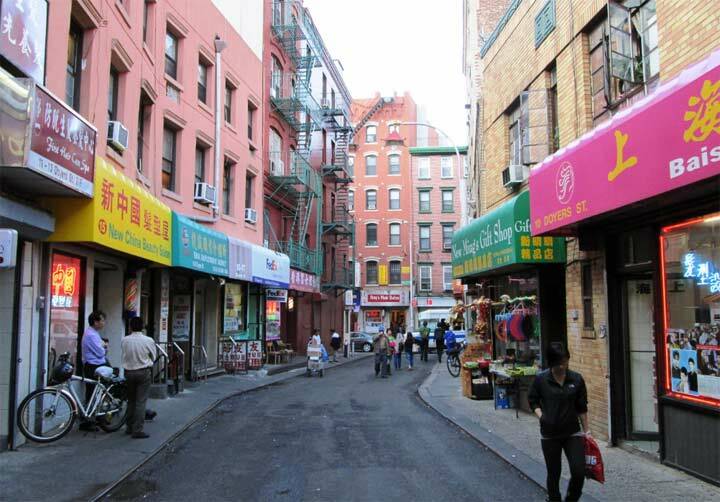 About the only thing I forgot to mention is that the alley, between South 6th Street and Broadway east of Kent Avenue literally in the shadow of the Williamsburg Bridge, was named for David Dunham (1790-1823) a local merchant who initiated one of the first ferries from Williamsburg to Manhattan. In fact this accomplishment earned him the title “Father of Williamsburg(h)” — it still had the “h” when Dunham was alive. He was a tireless advocate for travel by the then-new steamship, and died from drowning after falling off of one in the Hudson River on the way from West point to New York. Dunham Place first appears under that name on maps around 1850. When I first found it in 1999, it still had Belgian-blocked streets and was unshaded by trees. A chiseled “Dunham Place” sign could be seen on the corner building on Broadway, which remains. The Belgian blocks have been paved over. The east side of the street is lined with brick tenements, some of which have wide entranceways, suggesting former stables. Much of the west side is now dominated by a new condo building. Most interesting, in 2018 it has what amounts to an antique streetlamp, a 20-foot tall Type 8 curved-mast, complete with bracket. A few dozen of these can still be seen around town, though many are dwarf varieties seen beneath elevated trains. 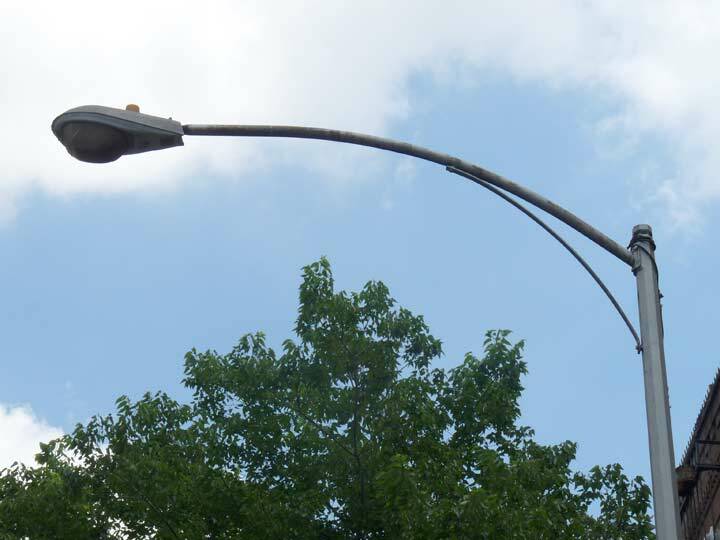 Though most of Brooklyn now has Light Emitting Diode Verdeon lamps, Dunham Place’s General Electric Type 250, which dominated NYC from the early 1970s to 2009, is still hanging in. Its warm yellow glow is so far deemed sufficient as the lone Dunham Place lamp. Of course I realize Department of Transportation personnel take note of such things, but I implore you–save this old streetlamp! I worked on the second floor of the building in the top photo for several years, ca. 1990-94. I well recall those cobblestones. I also remember parking my car on them and the day that I came out to drive home and found that all the wheels were gone. It was in the days when walking through that section of Williamsburgh was a risky proposition, before it became the epicenter of hipsterdom. I recall that on the front of the building on Broadway there were star shape iron objects that must have been fastened to structural elements holding it all together. There were massive exposed wooden beams that kept the printing presses on the floor above where I was working from crashing down on us. It all had a very nineteenth century feel to it.